Beloved Sis. Nitz de Guia at JMCIM Worship Service, Amoranto Stadium, Quezon City, Phils., Oct. 2011. 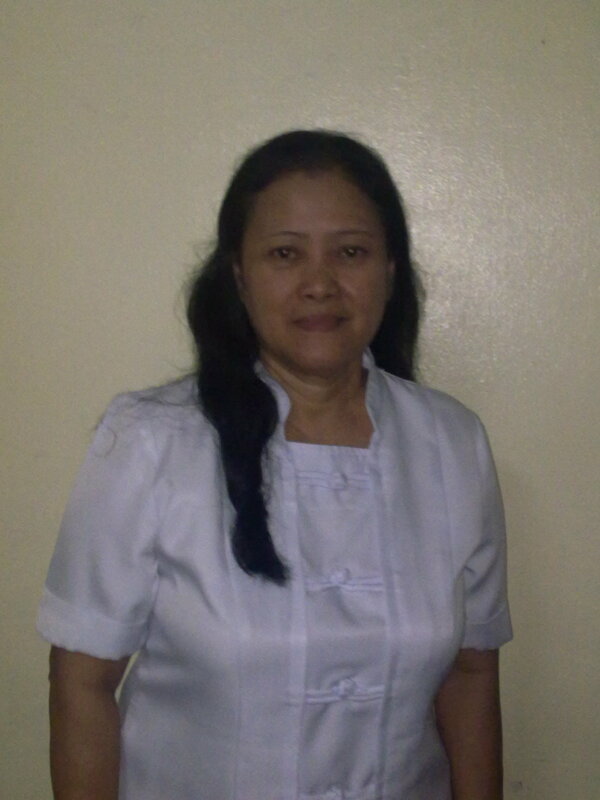 Before Sister Nitz de Guia surrendered her life to the Lord Jesus, she was a nurse in a big government hospital. Just after she and her beloved husband, Brother Lito, were married and Sis. Nitz became pregnant with their first child, she started to be sick. While two months pregnant, she underwent appendectomy. On that same year, she delivered her baby via caesarian section. Immediately after this, she underwent exploratory laparotomy due to abdominal intussusception. Not long afterwards, she again suffered stomach pain that she was immediately brought to the hospital. While doctors attended to her, her bel. husband went home for a while to take a shower and get some change of clothes. When he returned, Sis. Nitz lay in bed with several instruments already attached to her. She was to be operated again for H. mole (Hydatidiform mole). Bro. Lito, feeling so dejected because of their miserable situation, just looked out the window, tears streaming down his face. At one point during this emergency surgical procedure, Bro. Lito was asked to choose between his bel. wife or their unborn baby. It was a difficult and painful decision in which he chose his wife, but God was so merciful to save their baby also and he lived. One of their children suffered from bronchial asthma from birth, due maybe to Sis. Nitz’ major surgery while pregnant. After all her ordeal, the family had to deal also with the frequent asthma attacks of their child, having to bring him to the hospital often. Soon, Sis. Nitz gave up her work in the hospital as a nurse, but she was advised by her doctor to come for check-ups every two weeks. She was told that her disease may lead to cancer if not properly treated. But about this time, a neighbor shared to them the Gospel of the Lord Jesus Christ and they were brought to the worship service of the JESUS MIRACLE CRUSADE INTERNATIONAL MINISTRY. Their whole family willingly received the Lord Jesus and were baptized in water in His name. Their child with asthma soon received complete healing and never suffered an attack again. Also, Sis. Nitz no longer returned to the hospital for her regular check-up, but focused on serving the Lord with her bel. husband. She no longer suffered from her disease as she claimed complete healing. During those times, Bro. Lito was just an ordinary bank employee. But as they continued to serve the Lord faithfully and fervently, they were tremendously blessed financially and materially. They now own and manage a multi-million plastics company. Over a decade of blissfully serving the Lord, their faith was tried. Sis. Nitz suffered a slipped (herniated) disc in the lumbar part of her spine. Because of this, she could no longer walk and do any work, not to mention the excruciating pain that she had to suffer night and day. Her legs and arms suffered atrophy, and she needed a wheelchair to go from one place to another. She testifies that the pain was almost unbearable. She had to change position every hour, and she needed the assistance of her bel. husband to do so. They were both losing much-needed sleep and rest. When the family went to the U.S. for a vacation, Sis. Nitz was on a wheelchair. Her relatives there offered to pay for all her surgery expenses, only that she had to undergo immediate operation to fix her spine. If not, her doctor warned her that she could become permanently paralyzed. But the couple rejected surgery as an option and chose to put their complete trust in the Lord Jesus, that He would be the One to heal Sis. Nitz as He had done the first time and to their child. And so, they continued to serve the Lord, never missing a service, despite Sis. Nitz’ difficult condition. After two years, she received complete healing, and her legs and arms went back to normal. Now, as their thanksgiving vow, Bro. Lito and Sis. Nitz support and attend crusades of the Church throughout the country. Whatever time of day or night, through whatever weather condition, they would be driving and racing to go to support the Lord’s crusades, even in far-flung and rebel-infested barangays (barrios) and provinces.